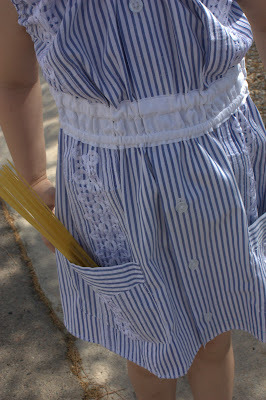 I thrifted this shirt last summer to re-purpose into a Zizza Dress. 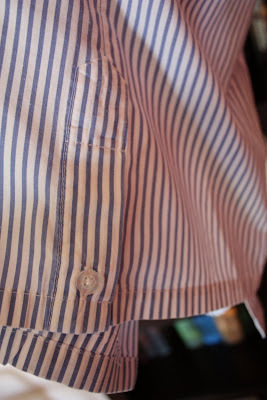 I loved two two stripes of embroidery, I loved the four (I already took one off) pockets. And quelle suprise! Look at those great vents at the hem! I’ll admit I didn’t notice those until I had it home. It’s been waiting hopefully in the closet for me to figure a way to incorporate all of those elements into one little dress. The day finally came. I happened upon Presser Foot while ambling about blog land and look what they’re making for this month’s sew along. I needed a distraction from my stalled progress in out fitting the bridal party this week so I jumped in to play. Now for the story part. 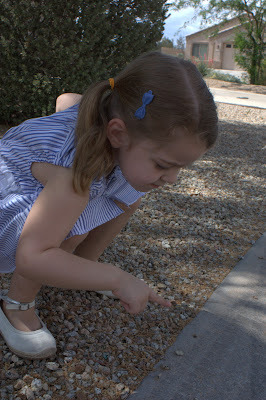 Would you believe this little girl’s pop enjoys to tease her? 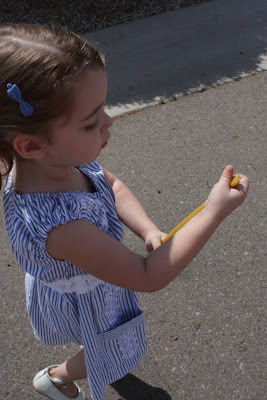 On Tuesday when she asked him what came in the mail he said “noodles.” I told her maybe he was teasing and maybe he wasn’t but what did she think? 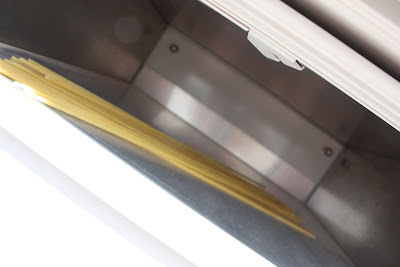 She thought he wasn’t and really wanted to know where the noodles from the mail box were. The thing is though, he was teasing and there weren’t any noodles. 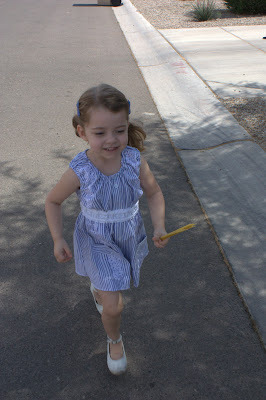 She was very anxious to get there so she walked her very fastest. Say, the pockets on her new dress are just right for this sort of thing! 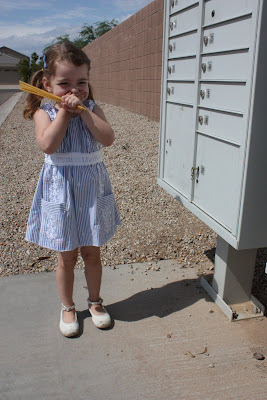 She couldn’t help but giggle at the thought of her poppa opening the mail box and finding it full of noodles! Into the box they went, now all that was left to do was wait. Well, that and walk home. Just a minute now, she spotted something. Would you look at that little fellow carrying such a big treat home to his family! 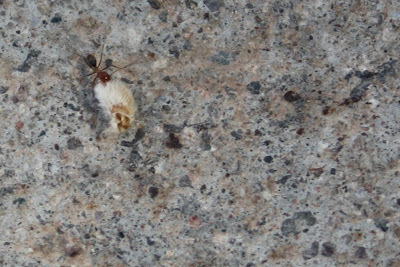 And isn’t it interesting how pretty the cement is when you look so close? Well, she waited the rest of the day, and when her pop came home he told her there had been noodles (of all things!) in the mail box! And he wasn’t even teasing this time. 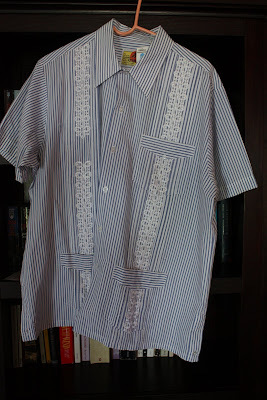 I strayed from the tutorial a bit to accommodate the bits of shirt I wanted to preserve. I wanted the embroidery to reach up over the shoulders so I cut my front piece to extend into a gathered strap. I started out planning to eliminate the sleeve piece all together but I needed the extra length from that piece to get the gather I wanted in the strap, so I used the piece but trimmed the length. I had really hoped to use the vents from the original shirt but it was just too wide, so they had to go. I had high hopes of preserving the vents for use in another project. I was thinking of a shorty little romper for The New One with a vent on each leg and one of those extra pockets square on her front. Alas, there’s just not enough of the shirt left to do it. 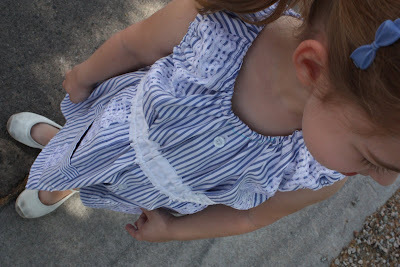 I’m still mulling over the romper idea though. great job! i love the shirt you chose. great i idea to use one with applique or whatever it is already on it. This whole post is cute. I love the dress. I love the teasing. I love the photos. Cuteness abounds! She is just the cutest thing I have ever beheld. 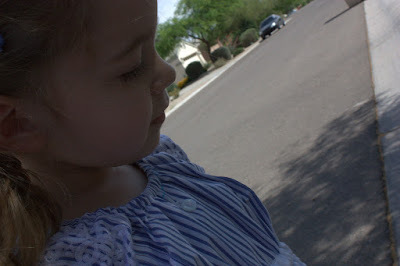 The picture of her by the mailbox laughing is adorable. To be totally honest, I didn’t love the shirt, but I LOVE the dress. Nicely done. Very pretty dress! That fabric is much nicer as a dress than a shirt, I must say. Found your blog a bit by accident today, and am glad!